Logo of the U.S. Department of Health and Human Services. The U.S. Department of Health and Human Services (DHHS) is "the United States government's principal agency for protecting the health of all Americans and providing essential human services, especially for those who are least able to help themselves." 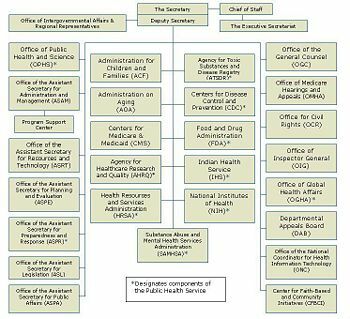 The DHHS is the latest of a long series of U.S. government departments whose responsibilities include public health. Its origins go back to 1798, when the early U.S. government set up an organization to deal with the health of merchant seamen, which was the ancestor of the United States Public Health Service (PHS). PHS is still an important component of U.S. health services, and is technically a "uniformed service", with its officers wearing what are almost identical to U.S. Navy uniforms, without PHS being an "armed service". Skipping over a long organizational history,, in which the precursors to the National Institutes of Health, Food and Drug Administration, the Social Security Administration, and other well-known agencies, can be seen, a cabinet-level department, the Department of Health, Education and Welfare (HEW) was established in 1953. HHS is headed by the U.S. Secretary of Health and Human Services. The health functions split off what was to become DHHS when the Department of Education was formally established in 1979. HHS received its new name in 1980. While the main Social Security Administration became an independent agency in 1995, but the administration of the Medicare component of social security (i.e., a healthcare reimbursement system for older Americans) stayed with DHHS, joining with some other programs to form the Center for Medicare and Medicaid Services. ↑ About HHS. U.S. Department of Health & Human Services. Retrieved on 2009-03-22. This page was last modified 11:05, 31 May 2009.